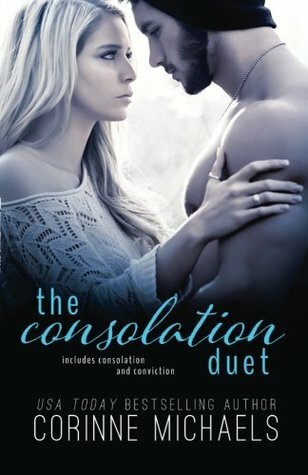 Series: The Consolation Duet is the second duet in the Salvation Series. Although it can be read as a stand-alone, I highly recommend that you read the Belonging Duet first. Liam wasn't supposed to be my happily ever after. He wasn't even on my radar. He was my husband's best friend—forbidden. But my husband is dead and I'm alone. I ache for him and I reach for Liam. One night with Liam changed everything. I fell in love with Liam only to be left shattered into a million pieces. Again. The idea of being without him cripples me but the reality is, he's gone. He doesn't understand and I can't make him. If only he'd see the conviction behind my words—then Liam would be here. Now I have to decide if it's him I love or if he was just the consolation prize all along. I absolutely adore this fan-made book trailer. ALL THE FEELS! 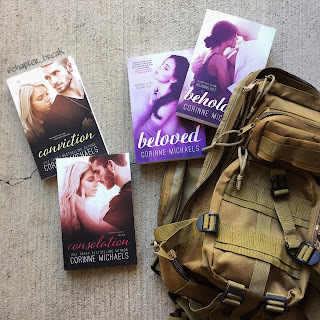 Corinne writes military fiction/contemporary romance novels with strong independent women, alpha male Navy SEALs with a soft side, and some of the greatest side characters. The Belonging Duet, which includes Beloved and Beholden are the first two books in the Salvation Series. I read these two books in May, back-to-back. I had planned to read another book for the aforementioned event after Beloved; Corinne had other plans. She hit me with a gut punch I didn’t see coming. Beloved ended in a way that I couldn’t stop myself from starting Beholden immediately (even if it was almost 1am!). You may be wondering why I've just been talking about the Belonging Duet and the series in general, when this is a review for the Consolation Duet. Here's why: we first meet Natalie in Beloved. Which is why I think, if you haven't already, you should really start at the beginning to get the full effect of this story. Although I loved Jackson from the Belonging, I fell fast and hard for Liam Dempsey in Consolation. Catherine and Jackson's relationship was full of passion and fire, but Liam and Natalie's romance was more of a a sweet and gentle slow burn. Rocked by the tragic loss of her husband at the end of the Belonging Natalie is left pregnant and heartbroken. Unsure of how to move past the loss of her husband, Natalie finds and unexpected comfort in his best friend, Liam. Both Liam and Natalie are wracked with guilt over the feelings they have for each other. But he's gone. What they're doing isn't wrong. Can Natalie do it all over again? Give her heart to another soldier? Liam slowly wins over Natalie's heart through his kindness and the love he shows for her daughter, Arabelle. Maybe it's just my maternal instincts kicking in but I can't help but swoon over a man who deeply cares for a child that's not his by blood. The way Liam is with Arabelle made my heart melt. He's what every single mother could hope for. "He amazes me with the amount of care and tenderness he has. He's killed people, interrogated terrorists, climbed mountains, and who knows what, but with me . . . he's different"
I felt such a strong connection to Natalie. So many of her struggles have been my struggles. It was often hard for me to see feelings I've had written down on paper. I'm going to admit that a couple times I was tempted to give up and quit reading all together. I didn't want to admit to having those feelings. In the end I think her story was healing for me. "Breathe and you'll figure this out. You're stronger than this." I love the main characters in Corinne's books but the "best friends" she writes really bring home the story for me. They make the characters more relatable and make me wish I had girlfriends like Catherine and Natalie do. Catherine's best friend Ashton is witty yet supportive and wouldn't bat an eyelash at taking someone down, should they do her friend wrong. Reanell and Natalie have bonded over shared struggles and everything that comes along with being a military wife. 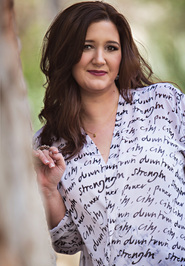 When their husbands are deployed Reanell becomes Natalie's rock; her anchor. I have some friends who've become my anchors over time. Some days I don't know what I would do without them. Sadly they don't live close to me and too often I wish they could be there just to cry with me and be a shoulder to lean on. Just like Ashton and Reanell do for their friends. To sum up my thoughts: I love this entire series! I LOVED this duet. I think I may have even enjoyed it more than the Belonging Duet. Mostly because of all the tender moments we got in these two novels and the stronger connection I had to the characters in the Consolation Duet. 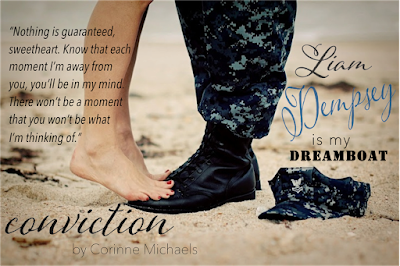 I am SO excited to get more of the Salvation Series in Corinne's upcoming release. 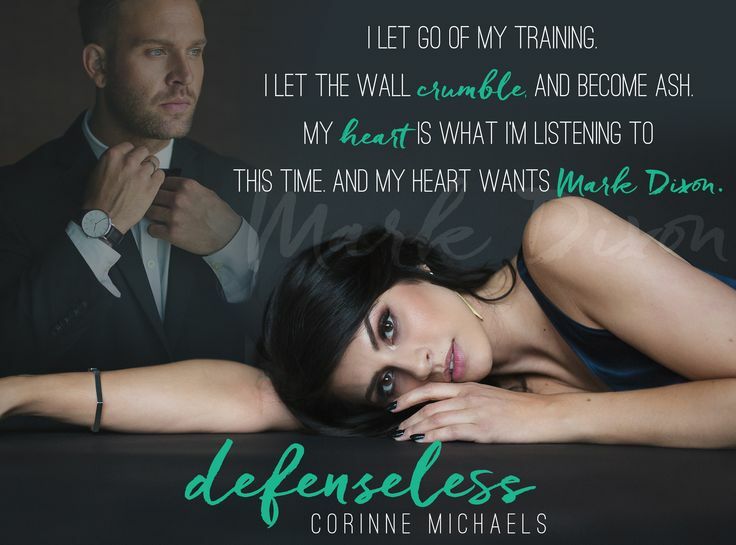 Defenseless is Mark Dixon's story and he is one of those favorite side characters I was talking about. Keep scrolling for more information. "Hope doesn't grant you wishes. It doesn't paint you a pretty picture or give you a place of relief. It's something we hold on to when we need something to believe in." 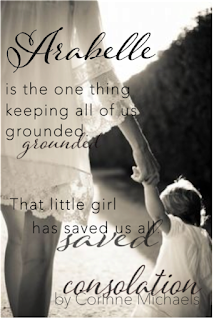 For more books in the Salvation Series click the links below. Want a chance to win a signed copy? We're both stubborn, calculating, and controlling. Mark Dixon doesn't know what he's getting into. He doesn't know his games could cost us our lives. I have to do what is necessary to keep us alive, and that means guarding my heart. But I know I'm defenseless against him, and in the end, he'll force me to surrender. Corinne Micaels is the USA Today and Wall Street Journal Bestselling author of The Salvation Series. She's an emotional, witty, sarcastic, and fun loving mom of two beautiful children. Corinne is happily married to the man of her dreams and is a former Navy wife. After spending months away from her husband while he was deployed, reading and writing was her escape from the lonliness. Both her maternal and paternal grandmothers were librarians, which only intensified her love of reading. After years of writing short stories, she couldn't ignore the call to finish her debut novel, Beloved. Her alpha Navy SEALs are broke, beautiful, and will steal your heart. YoBit lets you to claim FREE COINS from over 100 distinct crypto-currencies, you complete a captcha one time and claim as many as coins you can from the available offers.